I haven’t made a post solely dedicated to a fermenting beer since my very first brew. I’ve learned a lot about brewing since then and gotten much more comfortable brewing. I feel that the Schnellweiße marks a major milestone for me in my brewing experience – it is my first sour beer, partially fermented with a bacteria called Lactobacillus that I grew in a starter inoculated with just a handful of grains. After about four or five days of incubation at 90-110 degrees F, the starter was tasting tart and smelling doughy, though I was concerned that this might just be the result of mixing apple juice and DME in equal ratios. However, the next morning I was rewarded by this gruesome sight. A terrible and awesome sight. 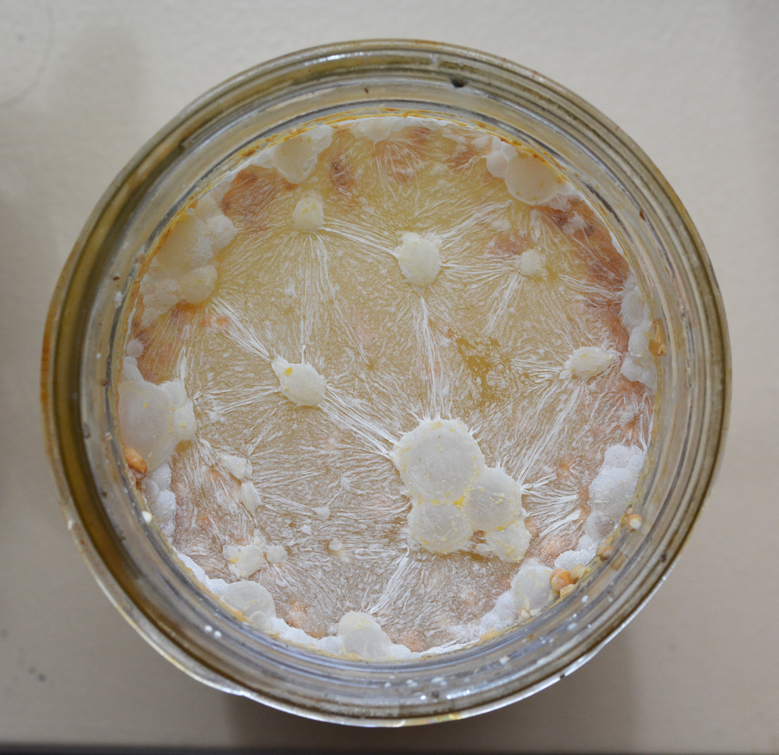 A healthy lacto pellicle like this is just what I was hoping for. With this mason jar of healthy lactobacillus in hand, I brewed 2.5 gallons of wort from about 3.5 lbs of mixed pilsner and wheat malt. I neglected to take a gravity reading and neglected to even take a good measurement of the volume. Hopefully I’ll come out in the end with 5 gallons of about 1.032 gravity wort. Next time I’ll be more careful. I pitched the whole starter after cooling the wort to about 90 degrees, and then put it in a 110 degree water bath. After having nearly 24 hours to settle in, the lacto have taken hold, forming a new pellicle across the surface of the wort. The airlock bubbles very occasionally and gives off no foul aromas. I look forward to pulling a sample in a few days before carrying on to pasteurize this half of the wort and brew the other half before inoculating with S-04 I just harvested from Jason’s (now bottled) brown ale. This entry was posted in beer, brew day and tagged fermentation, lactobacillus, sour beer, weisse, wild yeast on June 9, 2013 by Dylan Bargteil.